Apple has released WatchOS 2.0.1 for Apple Watch users, the update includes several bug fixes, but perhaps most notable are improvements to battery life performance. 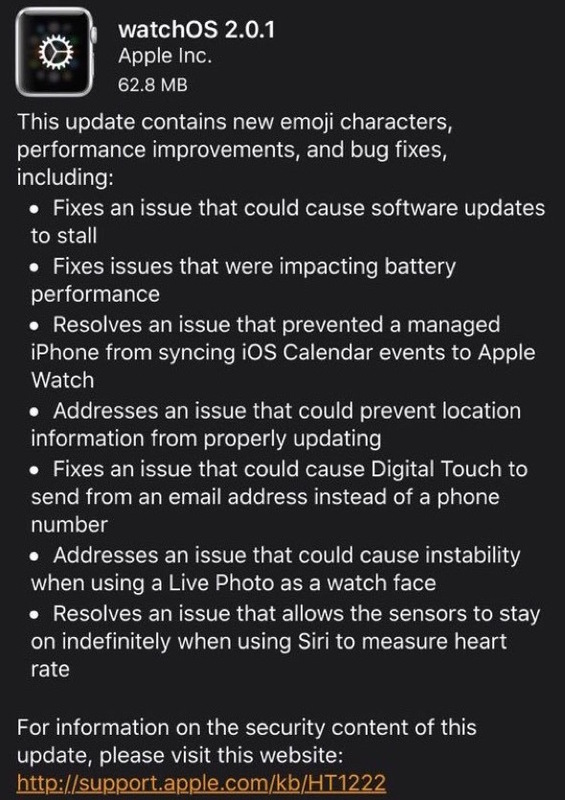 WatchOS 2.0.1 also includes support for new Emoji icons introduced in the accompanying iOS 9.1 update for iPhone and iPad, and OS X 10.11.1 for Mac. The update should proceed without an issue. 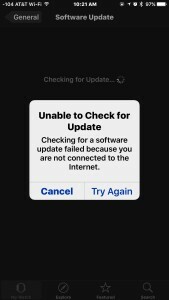 If you encounter an error message that says “Unable to Check for Update – Checking for a software update failed because you are not connected to the Internet.” even if you are online, you can tap Try Again a few times, but from direct experience the only resolution to the error message was to reboot the iPhone and reboot the Apple Watch. Toggling Airplane mode and turning wi-fi off and back on made no difference in the update check. Installing WatchOS 2.0.1 takes about 45 minutes, depending on the speed of the internet connection. – Addresses an issue that could cause instability when using a Live Photo as a watch face. – Resolves an issue that allows the sensors to stay on indefinitely when using Siri to measure heart rate. Installing Watch OS updates takes 2 hours, totally unacceptable. Just put a damn port on this thing, transferring over Bluetooth is clearly too slow! The transfer took 18 minutes, including the download to the phone. The watch is now installing the update, this will take 5 minutes or more. So +/- 25 minutes for me (iPhone 6+). Still can’t get it to install. Just keeps going through the whole thing and then says it can’t verify because it’s not connected to the net. Better battery life? Count me in! Not that I’m complaining about the current battery life on my Apple Watch. <3 Apple! Yeah, I’m still having the “not connected to internet” issue and I’ve been trying since the update was released. Next step I guess is to try to unpair the watch from the phone and pair again and see if that helps. Update: unpair and re-pair worked… shouldn’t have to do that but that’s what worked. (2.0.1) after update, I can’t write sms! Have re-paired the watch and did a new install. Still getting the message checking and then can’t because not connected to Internet. Anyone have any other suggestions?